Another Delco Guy In South Jersey: What A Slugger! Emma did really well tonight in her first game of 'coach pitch.' 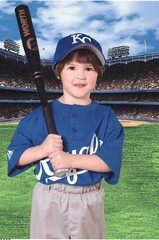 She had one really great hit out past third base. John played well tonight too, making a few nice plays in the field. He's got a lot of baseball coming up, so it's good he is playing well!